Bluetooth, heated mirrors, cruise control, power windows, power locks! On Sale! Save $1000 on this one, we've marked it down from $24900. Few vehicles have such broad appeal as a full-size pickup and the Ram 1500 is no exception. 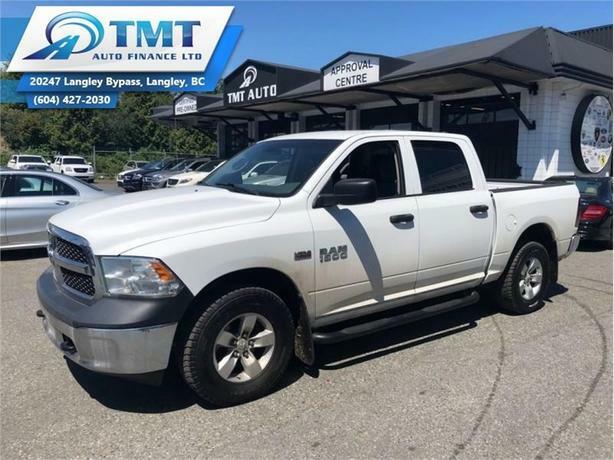 -Car and Driver This 2013 Ram 1500 is for sale today in Langley. The reasons why this Ram 1500 stands above the well-respected competition are evident: uncompromising capability, proven commitment to safety and security, and state-of-the-art technology. From the muscular exterior to the well-trimmed interior, this truck is more than just a workhorse. Get the job done in comfort and style with this Ram 1500. This crew cab 4X4 pickup has 78000 kms. It's white in colour. It has a 6 speed auto transmission and is powered by a 395HP 5.7L 8 Cylinder Engine. This vehicle has been upgraded with the following features: Bluetooth, Heated Mirrors, Cruise Control, Power Windows, Power Locks. To view the original window sticker for this vehicle view this http://www.chrysler.com/hostd/windowsticker/getWindowStickerPdf.do?vin=1C6RR7KT4DS578858. Buy this vehicle now for the lowest bi-weekly payment of $177.43 with $0 down for 72 months @ 4.99% APR O.A.C. ( Plus applicable taxes - Plus applicable fees ). See dealer for details.